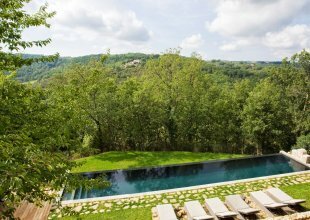 A beautifully restored villa surrounded by nature, and only a few minutes away from towns and main roads. 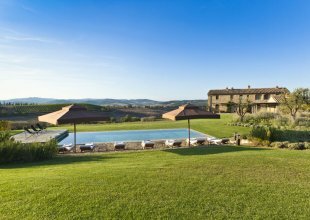 A place where the highest standards of comfort meet real Tuscan luxury. Set in over 60 acres of spectacular mature grounds, with umbrella pines, cedars, elms, cypress, and enchanting pathways for strolling, Villa il Principe is a beautifully designed and wonderfully imposing late 18th century estate with a history of being a gathering point for family and friends from all over Italy. 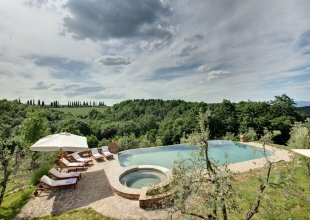 Set in rolling countryside of Chiusi, on the edge of both the panoramic delights of Southern Tuscany, its Val d'Orcia and the intrigues of Umbria, the villa is surrounded by historic towns and villages. The 15th century architectural gem of Pienza, also noted for its pecorino cheese farms, sits close by, as do the fine wine towns of Montalcino, famous for its Brunello wines, and Montepulciano, of Vino Nobile fame. This area of Tuscany is known and appreciated for its food, prepared by locals with passion and desire to share it with their visitors! The villa has been finished to an exemplary standard throughout, with comfortable bedrooms, quality linens and en suite bathrooms with classic-contemporary finishes. The outdoors offer shaded al fresco spaces and a few steps away from the villa, the swimming pool, equipped by a bar corner, offers fantastic escape time thanks to a very cosy and unique four-poster bed, ideal for resting during the hot days of the Tuscan summers… and for the more active ones, water bikes are available by the pool. The property has been restored by Astrid Schiller Wirth, well known for her design of the Hassler Hotel in Rome. Her inspiration and unique style have created sumptuous interiors with cosy bedrooms, elegant reception rooms and a fabulous modern kitchen. The pieces of furniture created especially for the villa are unique and beautiful. The setting of the different rooms, with the living areas on the ground floor and the bedrooms on the first floor, makes this villa very enjoyable both for couples and also families with children who may want that little bit of privacy.